“Yes, xylitol is very toxic to your dog, and it doesn’t take much. Xylitol is a sugar alcohol used as a sweetener in many human sugar-free products. In addition to replacing sugar in many foods, it also has some benefit in reducing cavities by helping dental enamel heal. Unfortunately, xylitol is very toxic to our dogs. It causes hypoglycemia which is low blood sugar and hepatic necrosis or liver death. If your blood sugar gets too low, it can result in loss of appetite, lethargy, weakness, twitching, and eventually seizures and unconsciousness. 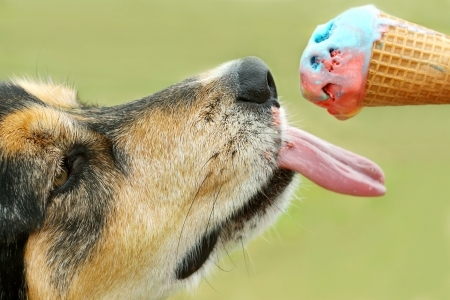 Probably the most common source of toxicity to our pets is sugar-free gum or candy. A single piece of sugarless gum will contain between 0.2 and 1 gram of xylitol. It only takes 0.1 grams per 2 pounds of body weight to cause hypoglycemia. That means a single piece of sugarless gum with xylitol can cause hypoglycemia within hours in dogs up to 22 pounds. Even worse, it only takes 0.5 grams per 2 pounds of body weight to cause hepatic necrosis. So that single piece of sugarless gum with xylitol can cause liver death in dogs up to 4.4 pounds within 1 to 2 days. Recently, I was visiting a friend and they joked about their dachshund getting into everything. In fact, she had just eaten a pack of sugarless gum as we arrived. Fortunately, they got her to the emergency clinic before any serious damage was done. The dog did have to have vomiting induced, be given activated charcoal, and spend the night for observation. Not a small, incidental expense for eating 6 pieces of sugar-free gum. Gum and candy are not the only problems. There are a lot of surprising sources. I use peanut butter to give my dogs their medications. Certain organic or all natural peanut butters contain xylitol as a sweetener or carbohydrate source. Always check the label! Examples of other products include nasal sprays, vitamins, toothpaste, lip balm, and drink powders. There are several websites available that contain lists of products with xylitol. One final, worrisome source is prescription medications. One generic medication prescribed to pets with orthopedic pain is meloxicam. The liquid form of Mobic contains xylitol. A dog was recently seen for an overdose of meloxicam. It also resulted in a toxic level of xylitol and the dog had to be treated for both problems. The ASPCA Animal Poison Control Center (APCC) is available for any animal poison-related emergency, 24 hours a day, 365 days a year. If you think your pet may have ingested a potentially poisonous substance, call (888) 426-4435. A $65 consultation fee may be applied to your credit card.